Including 4,102 referred on to the customer services of the different divisions and subsidiaries concerned, and 199 handled by the Mediator in the last form of amicable resolution. 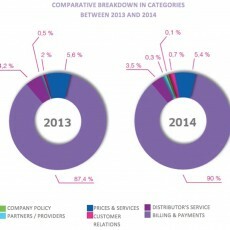 Based on figures for the 1st half, 2015 will follow the same trend as 2014, namely a reduction in requests but a rise in the number of disputes handled by the Mediator, more particularly due to the effective extension of the Mediator’s remit to entities that previously did not mention this option of out-of-court dispute resolution to their customers and negotiating partners. Here is a presentation of the Mediation service and the highlights of 2014. ❝We have high ambitions. “We want to give our customers more information about our mediation service. Continue our in-depth dialogue with the consumer organizations and mediators in France and Europe. Adapt the ADR directive. Roll out mediation in the 70 countries where the Group operates, and draw up an annual report by the mediator, a lever of progress for our operational divisions❞. stated Jean-Pierre Hervé, ENGIE Group’s Mediator since 1st July 2014.